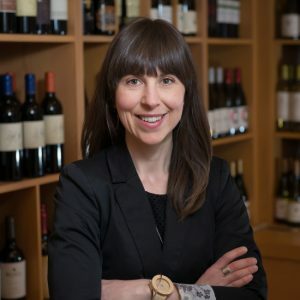 The knowledge and experience in the field of wine making gained by the Fioroni brothers over the years, led them in 1989 to a new business venture: bottling and selling their wine. At Poggio Alloro, quality starts in the vineyard, where they practice severe pruning, low yields, and the use of organic fertilizers. This organic producer is also a very well-know Agrotourismo (a facility which gives visitors/guests the opportunity to experience farm life, get in touch with nature and animals, and taste traditional cuisine, as well as the products from the farm) with gorgeous views of rolling vineyards and the village of San Gimignano. Broad and elegant with pleasant aromas of red fruit, cherry, blackcurrant and raspberry with final flowery notes of sweet violets. Produced by the Fioroni family from organically grown grapes at their agriturismo in San Gimignano, Tuscany. 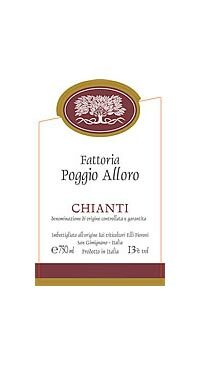 This Chianti is a blend of Sangiovese, Canaiolo, Colorino and, our favourite grape to pronounce, Ciliegiolo. Fermented in stainless steel and matured in bottle resulting in a vibrant red fruit driven style, this wine has lots of brightness on the palate with red fruit, blackcurrant and violet. Soft tannins make this an easy wine to sip on with lighter fare, vegetable based dishes and of course your classic tomato based pasta and pizza.